Gus G requires a lot from his amps. He needs them to keep up with his power metal shredding in Firewind, but he also demands that they keep up with the various eras of rock and metal tone that he needs to convey during the course of a typical Ozzy Osbourne set. As Ozzy’s guitarist he has to dip into vintage 70s metal, 80s neoclassical and hard rock, the more gained-out approach of Zakk Wylde and his own, modern-voiced Ozzy material. The Blackstar Blackfire 200 is a 200 watt beast of an amp designed to pump out the required tones at the required volumes. There are plenty of benefits to be gained from using active pickups, not the least of which are low noise and high signal integrity over long cable runs. But not everyone loves the sound of typical actives. EMGs are well known for their killer metal tone – they’ve driven the tones of players like Metallica’s Kirk Hammett and James Hetfield, Zakk Wylde and Devin Townsend to name just a few – and their single coils were long used by Pink Floyd’s David Gilmour. Seymour Duncan seems to be especially good at spotting holes in the market, and there was a pretty glaring one in the active sector: players who want the benefits of active pickups but would prefer a more organic tone. The Blackouts series of pickups do a great job of this, but the Blackouts Modular Preamp is another very clever approach to the issue. Available separately and in the Blackouts Coil Pack and Gus G FIRE Blackouts System signature set (which is featured in some of Gus’s signature ESP and LTD guitar models), the BMP-1s replaces your existing volume pot, throws in a 9v battery, and allows you to get a high gain active guitar sound from any passive four-conductor pickup. In Gus’s case, the BMP-1s is combined with a matched pair of low-out Alnico 5-loaded passive humbuckers. Gus explains: “This system combines the massive tone, kick, and distortion of Blackouts with the rich tone and expressive feel of my favorite passive pickups. It responds perfectly to all my picking techniques, and more of my personality comes through than with any active pickup I’ve tried.” Naturally Gus needs plenty of sonic versatility within the rock/metal realm, since he does double time in Firewind and as Ozzy Osbourne’s guitarist. CLICK HERE to buy the Seymour Duncan Gus G Signature Humbucker Pickup Set from Guitar Center. 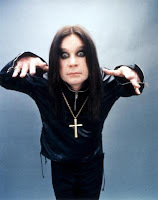 NEWS: So what’s going on, Ozzy? Dario Lorina? Gus G? * Ozzy gives interview saying Zakk’s out. Zakk has no idea what’s going on. * Zakk still has no idea what’s going on. * Rumours start to circulate that a new guitarist has been picked. An anonymous poster tells I Heart Guitar (in the comments section of this post) that Dario Lorina has been picked as the new guitarist (prompting me to run this sneaky profile of Dario Lorina while waiting for more news). * Blabbermouth reports that several different sources have told it that Gus G of Firewind will perform with Ozzy at Blizzcon. So what’s the true story? I sure as heck don’t know! If Zakk’s really been booted out without so much as a phone call, that’s a pretty lame way for things to go down. Zakk’s a huge part of the Ozzy Osbourne legacy and deserves much better than this.